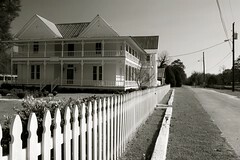 The Ruskin Colony, named after the English socialist writer John Ruskin, was a utopian socialist community in Tennessee from 1896-1899; after it was dissolved, the remaining 240 colonists moved what was left of their possessions by train to south Georgia to this place just outside Waycross, conveniently located right on the railroad tracks. Here they merged with the Duke Colony and became known as the Ruskin Commonwealth. After only on e year, the colonists' number had dropped by half: the land was not very fertile, the water sources were bad, and the colonists were plagued with disease. They quickly slid into poverty and in order to settle their debts, the Ware County sheriff auctioned off all there belongings thus forcing the colony’s demise 1901. All that is left today is a church standing in by the railroad tracks. It is hard to imagine that this once was a settlement that housed 240 people. The church is very pretty and well maintained, something to be thankful for I guess. The above photo was taken on April 5, 2007, during a camping trip to Stephen C. Foster State Park near Fargo, GA. I was hoping to see more of the swamp but due to severe drought conditions, boat tours were limited, and the Trembling Earth Boardwalk led through dry woods instead of over swamp water. 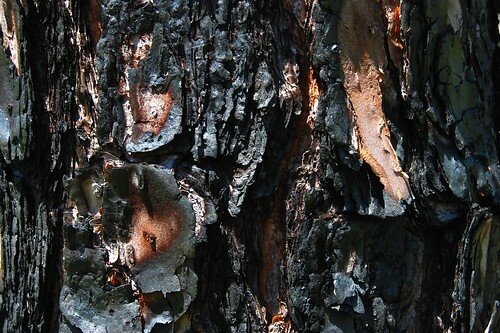 On April 16, 2007, just 11 days after my visit, a tree fell on a power line in Waycross and started a fire which, due to drought conditions, low humidity and high winds quickly spread and entered the Okefenokee NWR four days later. 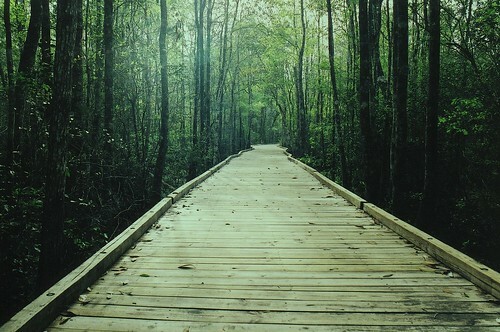 There it combined with a wildfire that had started a week earlier inside the swamp. By April 30, the fire had consumed 80,000 acres (320 qkm), 20 % of which were in the refuge. By May 9, 116,000 acres (469 qkm) had been burned within the triangle formed by Waycross in the north, Fargo in the west and Folkston in the east. The next day, sub-tropical storm Andrea crossed over bringing with it more wind but unfortunately, very little rain. As a result, the fire spread to northern Florida. A separate fire started on the Okefenokee's Bugaboo Island on May 8; it spread extremely fast and soon combined with the Waycross fire. Eventually, these fires burned more than 600,000 acres (2,400 qkm) of the Okefenokee region in three months. Essentially all of the swamp burned, though the degrees of impact vary widely. During the time of these fires, smoke blanketed much of South Georgia and sometimes drifted as far north as Atlanta (300 miles) and as far south as Orlando (250 miles). 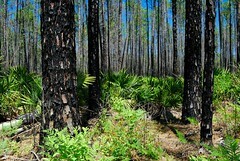 The scars of the massive wildfire of 2007 were still visible a year later on Chesser Island in the Okefenokee NWR, about 10 miles west of Folkston. Wildfires are a common and necessary occurence in the swamp but a chain of events led to the largest wildfire in the history of both Georgia and Florida, the largest wildfire to occur outside of Alaska, and the most expensive wildfire ever for the U.S. Fish and Wildlife Service ($ 30 million). 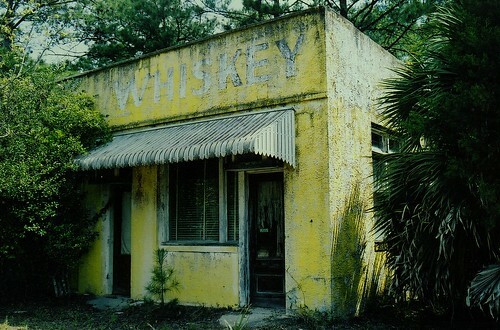 This abandoned liquor store sits on U.S. 17, adjacent to the equally abandoned Riverside Motel, in Nassau County, Florida. 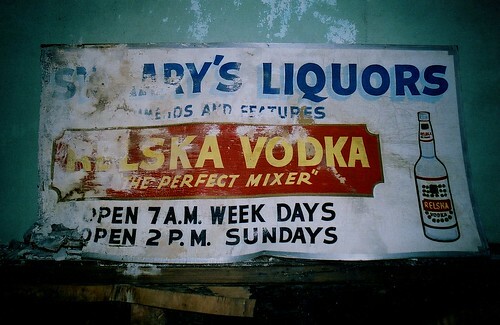 With the Georgia state line less than a mile down the road, we can safely assume that this was a hopping place on Sundays - to this date, alcohol sales are generally prohibited in Georgia on Sundays, with some exceptions made at the discretion of local governments. Cities and counties of sufficiently large populations may authorize Sunday alcohol sales by the drink at festivals, large events, and licensed establishments in which most revenue is generated through sales of prepared food. Georgia is one of only three states that prohibit stores to sell alcohol on Sunday (Connecticut and Indiana are the other two). Legislators have been pushing for several years to have the ban lifted, to no avail. The Sunday sales measure will be reintroduced in early 2009 and is expected to again be vigorously debated. When I moved to Georgia 20 years ago, the concept of not being able to purchase a bottle of wine on a Sunday was quite new to me. When out in a bar or club on a Saturday night, I found the custom of "last call" at 11:45 pm strange and somewhat amusing. Another law that took some getting used to was the "open container law". Interestingly, Georgia is one of seven states that have no state law against general public possession and/or consumption of an open container by a person of legal drinking age, however, nearly all local jurisdictions in Georgia do prohibit public open containers, and Athens, GA is one of them. In another ironic twist, the open container law does not apply on the University of Georgia's football game days, when the town turns into one big tailgating party where plenty of booze flows in plain view. Labels: usa florida "nassau county" "u.s. 17" "liquor store" "liquor sales" "georgia liquor laws"
Toomsboro is located in the heart of Georgia on a railroad line that crosses the kaolin country between Sandersville and Macon. 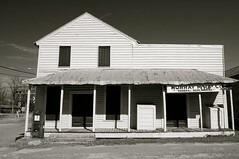 Once a booming little railroad town, it has an almost ghost town feel today - the general store, opera house, hotel and depot sit quietly in the hot Georgia sun silent reminders of the hustle and bustle that once characterized this town. The Swampland Opera House, seen in the background of the photo aboe, was built in 1916, and originally housed a dry goods store and a bank. 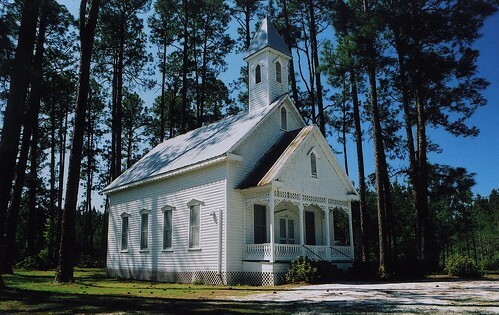 In 1975, Joe Boone, Jr. started the Swampland Opera House as a weekend venue for musicians throughout the southeast and each Saturday until 2000, a country, gospel & bluegrass music fest was held here. The building features a stage with theater seating, a restaurant, vintage bank with vault and a second-story loft with elevator access. The loft area was used as a movie theatre at one time. 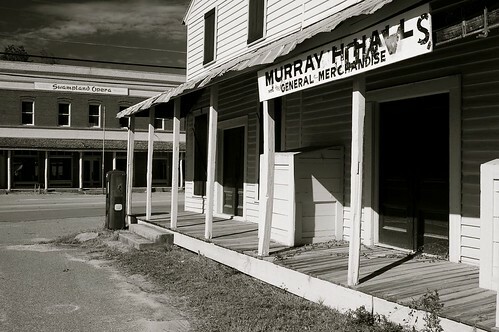 The Murray Hall General Store and gas station was built before the Civil War, and was originally a whiskey store. Mr. Hall's sister taught first grade in Toombsboro for several decades. The store is locked up but according to locals still contains a good amount of original merchandise. There were plans to offer public tours to the store as part of the "Wilkinson Weekends" project, but I am not sure these plans ever materialized. The Willett Hotel was built in the 1800s and has recently been completely restored. It features 16 rooms and 14 baths, refinished hardwood floors throughout, new central heat and air, high ceilings, extensive woodwork and many other vintage features. It was part of the Toomsboro package that was for sale a few years ago for only $ 695,000 according to some sources and a more realistic figure of 6,950,000 according to others. The hotel was quite busy in the early years of its existence, when Toomsboro was an important railroad stop and had a lively economy. This is where mainly traveling salesmen and newly arrived teachers stayed. The Central of Georgia Railroad line connecting Savannah and Macon County was built between 1835-1843. When the road was being surveyed, the citizens of Irwinton did not want it to run through their town for fear that the trains would run over all their livestock and children - the same reluctance, or hindsight, could be seen in Oglethorpe County's towns of Maxeys and Lexington. Irwinton, the Wilkinson County seat, was thus by-passed by the railroad; smaller stations along the road were originally known by their numbers such as 15, 16, and 17, standing for Emmitt, Wriley and Gordon respectively. At first, there was no station at Toomsboro, with station 15 (Emmitt) only one mile to the east. Toomsboro emerged later; the first post office was established in 1859 and the town was incorporated in 1904. 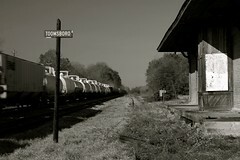 Today, Toomsboro has a population of 619 (2007). Trains, long ones at that, still pass through, but they no longer stop. 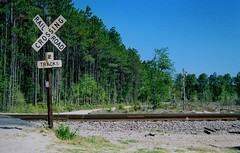 This Norfolk Southern railroad line runs from Savannah to Millen to Tennille, through Toomsboro to Gordon and Macon, then from Macon to Columbus where it curves north and dead-ends in Greenville (GA). Labels: usa georgia toomsboro "wilkinson county" "railroad town" "off the map"
Pomegranate Hall was built in the 1830s by Judge Nathan Sayre and is located where Elm Street (which runs south from Broad Street) dead-ends on Adams Street. 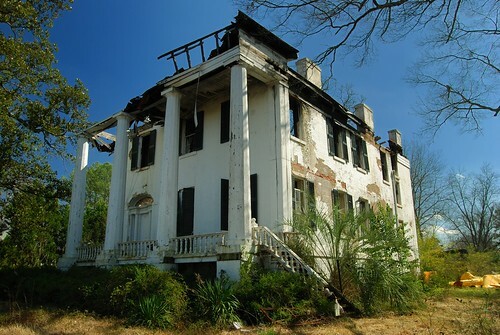 At the time, the house was painted a "monastic brown"which gave it a distinct Mediterranean appearance, and was sitting on several acres of lush Georgia land. The house is made of granite (possibly coming from Elberton, GA) and brick with walls two feet thick. The main floor consisted of an elaborate entrance hall, two reception rooms and Judge Sayre's extensive library . Features like marble mantles and silver bells and knobs gave it a sophisticated urban rather than rustic feel. The multi-level house has many entrances, stairs and cul-de-sacs, and in the back, the house is three stories high. Underneath the front porch, barely visible today due to the heavy vegetation, is another entrance leading into the the brick-floored ground level. The house was generally referred to as a "half house" but it is unclear if it was due to the fact that its entrance was to the side rather than at the center, or if it shared materials such as shutters and doors with the Sayre home in Newark, NJ. 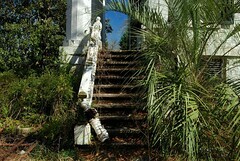 The original stair case led up to the center of the front porch, and was later moved to the right side of the house. A guest at the house in 1839 described her upstairs room as "delightfully situated; our windows attracted all the breezes and commanded imposing and beautiful views of the whole town and surrounding country". On an interesting side note, Nathan Sayre was one of few people of his time who challenged the racial color code. Although he never married, he had several children with one of his slave women and later lived with but never married Susan Hunt, who was part Cherokee, African, and Caucasion. They raised their three children here at Pomegranate Hall. In his library, Sayre kept books that argued AGAINST the then common belief that racially mixed offspring inevitably is degenerate and physically inferior. It is believed that the complicated layout of the house was to support the equally complicated family dynamics. After Judge Sayre's death in 1853, the house was bought by the Simpson family who owned it when diarist Frances Andrews stayed here shortly after Sherman had burned down everything a few miles south. The house then went to Judge Seaborn Reese who later replaced Alexander H. Stephens, native of nearby Crawfordville, GA, as congressman. In 1963, the widow of Oliver Macy (of the Macy's Department Store family) moved in and lived here until she died in the fall of 1992. The next owner was Emily K. Hair, widow of the late historian Dr. William Ivy Hair. In 2003, current owner Jerry Erickson bought the house from Steve Hair, who had inherited it from his late mother. According to Jerry Erickson and several Sparta residents, Ms. Hair in 1999 or 2000 was burning her son's clothes on his bed; the story is that he had a drug problem and burning his clothes was her way of dealing with it. Unfortunately, the fire spread from the bedroom down the stairwell and into the furnace, finally engulfing the entire upper floor. It's amazing that the house still stands. 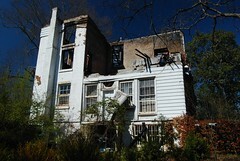 The photo on the right, taken in February 2008, shows the three-story back of the house and the fire damage. Restoring a historic building in compliance with city codes and codes that apply to historic structures is very expensive, and Mr. Erickson is doing his best to preserve the home while applying for funds and grants which is a tedious process. There is no estimate at this time as to when restoration of Pomegranate Hall will be resumed and/or completed. Labels: usa georgia sparta "hancock county" "pomegranate hall" architecture "the south" "the old south" "this old house"